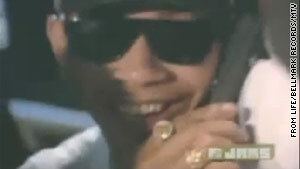 Conspiracy theorists say the cool cat in the "Whoomp (There It Is)" video could be a young Barack Obama. (CNN) -- Whoomp, there he is! Or is he? Conspiracy theorists suspect that a left-handed, dominoes-playing dude who appears in the music video for Tag Team's single "Whoomp (There It Is)" is none other than President Obama. The Obama look-alike makes a cameo about a minute into the video, sporting shades, flashy rings and a Zack Morris cell phone. Online message boards have been abuzz with what would be the best kept secret of the Obama presidency. Their argument: The guy flashing a smile in the 1993 music video looks a lot like the president, who would have been about 31 at the time. The online publication Gawker also weighed the evidence and points out -- Obama is a known fan of hip-hop, and he's left-handed, just like the man in the video. But on the flip side, the future president was a busy guy in the early 1990s. Obama was teaching law at the University of Chicago and working on his first book. His schedule might not have allowed for such frivolous pursuits. Plus, Tag Team is from Atlanta, Georgia, and Obama never hides his Chicago, Illinois, pride. "If Obama wanted to make his rap video debut, wouldn't he have chosen an early-90s act from his beloved Chicago? Maybe Da Brat, or Crucial Conflict?" Gawker asks. In a less-circulated, higher-resolution screen shot, the resemblance to the current president isn't as strong, leading Gawker to deduce that the mystery man is not Obama. The White House did not immediately respond to a request for comment on the issue. But even without an assist from Obama, the Jock Jams staple has managed to cement its place in history, coming in at No. 58 on the Billboard Hot 100's list of the "All-Time Top Songs."